This key’s housing is designed to be water and spark-proof. So it was used in environments where sparks could cause explosions, as on board of planes and ships. It was used on most wartime planes: the large bombers like Lancaster and Halifax as well on the fighter planes. Because it was water proof, it was also used in open canopy planes like the Swordfish, a torpedo bomber, made by Fairey. Fairey Swordfish, a torpedo bomber built by the Fairey Aviation Company from 1930 untill 1939, in service until 1945. One of their famous actions was the crippling of the Bismarck. This particular key I obtained at the Rosmalen Radio Flea market (in the south of The Netherlands), on March 12, 2011. I had been looking for such a key for along time. Why? I had one before, that I lost in a unpleasant way and I wanted to replace it to keep the memory to a wonderful time I spent in Canada. Back in 1970, at the age of 19, I was invited to spent 3 months at my aunt and uncle’s in Brentford, Ontario, Canada. One of the greatest things that happened, was a visit to an auction on the farm of Ernie Simmons, nearby. If you Google on this name, you will find lots of stories about this man and the auction of his goods, but I WAS THERE when it happened! So I wrote down what I remember of the event and scanned the photo’s I took. I will tell this story on a separate page, in order not clutter up the “Bathtub”-page. CLICK HERE FOR MY ERNIE SIMMONDS PAGE. 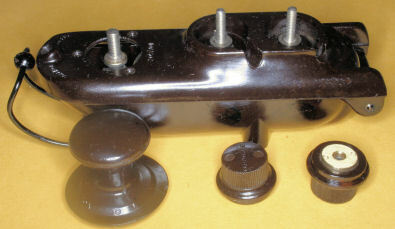 From left to right you see the hinges, the two electrical stubs, the signalling knob, the spring that hold upper and lower half together. 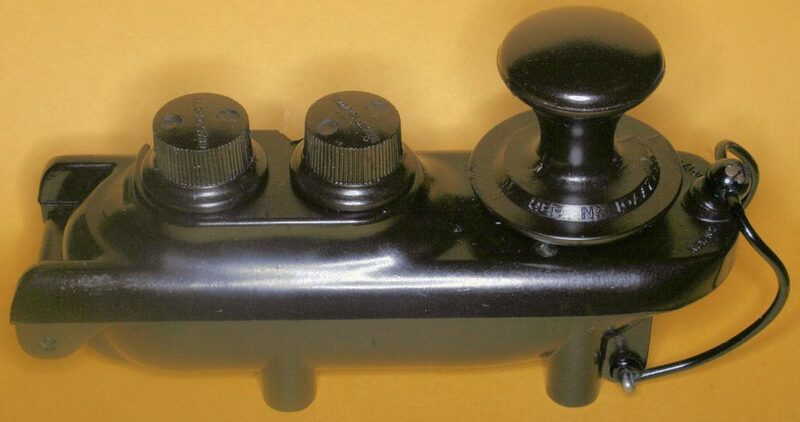 This spring has a second use: to hold down the signalling knob to broadcast a continuous carrier wave. This was done during netting procedures or when the crew had to bail out the plane, mostly over water, and doing so hoped that somebody could make a fix on their current position. The key on this photo is cleaned and preserved. Knobs taken off, not cleaned, yet. 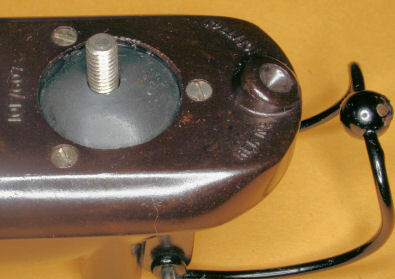 Stubs have a brass inside, held with two small bolts. 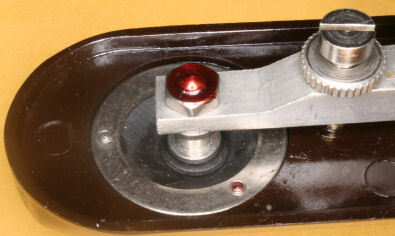 The membrane seal, under the signalling knob is removed. The key is mounted, upside down, in the lid. It has a strong spring action but remember: crew were wearing thick gloves, so the keys should withstand a harsh pounding. The original leather membrane is taken out because it was rotten away. 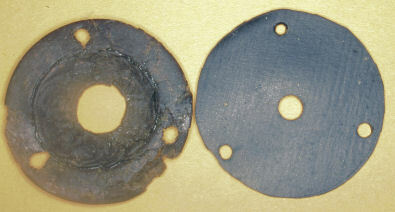 The key has adjustments for gap (left) and spring pressure (right). This key came out Stock and was never used. It has original red bonding seal on the bolts and original grease on the bearing. I left that in place. 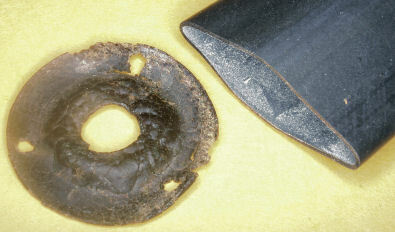 This seal was made from thin leather, I learned later. I replaced it with a peace of rubber, taken from an old inner bicycle tube. We have those plenty, over here in Holland. If ever I get my hands on a suitable peace of leather, I will replace it again.